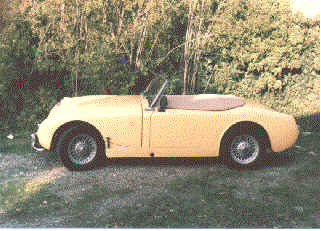 The Austin Healey Sprite, Bugeye or Frogeye, depending on your side of the pond, was first introduced in 1958. 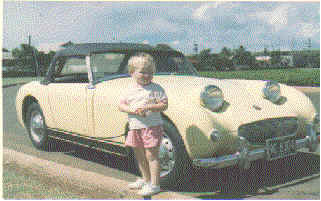 Having spent most of my time between 1958 and 1964 out of the country, I did not see my first Bugeye until 1964, after moving from Kodiak Alaska to Portsmouth Virginia. I was tooling down the highway along auto row in my 1958 Impala two door hardtop and as I'm prone to do when passing car lots, was scanning the various cars on the lots when I saw this smiling little face looking back at me. Not knowing what it was but being intrigued by the smiling grill and "Bug" eye headlights protruding from the hood (at that time I thought a bonnet was something a baby wore), I made a fast U-turn, pulled into the lot, and it was love at first sight. I traded the Impala on the spot without even driving the Sprite. Sandi, whom I'd met while in Kodiak, was now living in New York City, so the Bugeye became a frequent sight on the highways between Virginia and New York. Sandi, while a better than average driver, had never driven a "stick" shift. She learned in the Bugeye on the New York City freeways, it was a thrill to say the least. She wanted to look at the gear shift when she shifted, and with the Sprites very quick steering, tended to require anywhere from two to three lanes for each shift. My Navy buddy at the time, Tim, lived in South Carolina so the Bugeye also made many trips between Virginia and South Carolina. Sandi and I were married about this time and since Tim didn't have a car and the Bugeye was our only car, it often made the trip to South Carolina hauling the three of us. We drove the Bugeye for about 6 months and then traded it for a 1964 Corvair Monza. From the moment we drove away from the Chevy dealer I knew that I was really gonna miss the little guy. 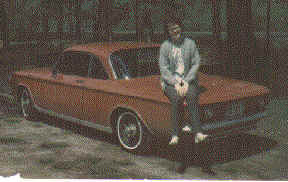 Shortly after trading the Bugeye for the Corvair, we moved to Lakehurst New Jersey for six months of school. While there, we traded the Covair for our first "Brand New" car, a 1966 GTO. After I finished school we were transferred to Hawaii. We drove the GTO to Oakland California and had it shipped to Honolulu. 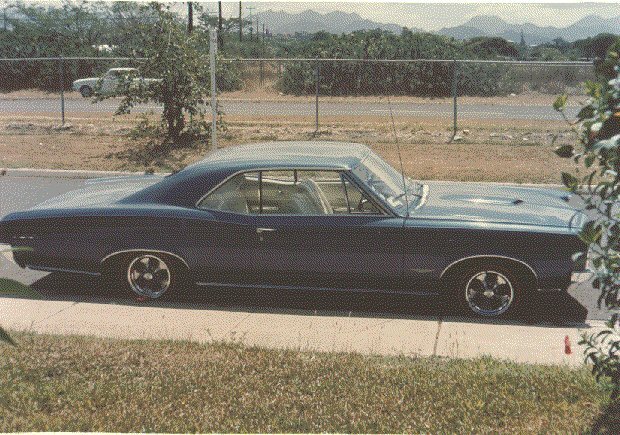 If ever there was a place in the world where you didn't need a GTO, it was the island of Oahu in 1966. The maximum speed limit on the island was around 35 MPH at that time. After a few months we traded the GTO for another "Bug" but this time it was a VW "Bug". It was about this time that we started thinking about another Bugeye. It did not take long to find one. We bought it and apparently we learned our lesson because we still have it. Dawn was born about this time and we also kept her. Originally the car was white with red interior the same as my first Bugeye. Shortly after purchase we had it painted primrose yellow. The car is now an even mix of 1957 Corvette yellow and Toyota Arctic white. This car is very much a world traveler. When we left Hawaii we shipped it to New Jersey which was about a three month trip by ship through the Panama Canal. When I picked it up in Bayonne It started on the first pull. I used the Bugeye as my daily driver for the six months that I was in school at Lakehurst for the second time, Sandi and Dawn having stayed in Texas with her parents. When I finished school, I was transferred to Monterey California. I piled everything that I had with me into the Bugeye and drove it as far as Texas. From Texas we towed it the rest of the way to Monterey. After three years in Monterey, again as my daily driver, me and the Bugeye were off again, this time to Guam. It was shipped from Oakland and took about 30 days to get to Guam, and again it fired on the first pull. Me and the Bugeye spent 15 months on Guam and then it was back to Monterey, this time for good. While I rode a 747, the Bugeye spent another 30 days riding a ship and this time, for the first time, it failed to start. This was in 1974 and the diaphragm in the old original mechanical fuel pump had gone belly up. Fortunately I had a towbar with me in the pickup when I went to Oakland to pick it up. After its return from Guam in the mid 70's the Bugeye was converted to disc brakes, wire wheels, and a 1275cc engine. For many years it was driven daily until its unfortunate encounter with a dog. One day on the way home from work, I swerved to miss a stray dog, lost control, ran it off an embankment, and tore it up pretty good. It took me years to get it back to where it was drivable and by that time I had become more involved with Porsche's than Sprites (Shame On Me). After I finally got it back together, it had an overheating problem that I could never seem to find the time to fix, so it ended up sitting in the garage and was slowly covered by all of the junk that accumulates in a garage over the years. In 1996 we decided to build another garage, a place where the Bugeye could reside and be assessable and maybe could be made road worthy again. By the time I finally got around to working on the Bugeye, its brakes and fuel system were a mess and had to be completely rebuilt. As these things go, one thing led to another and I ended up doing a complete rebuild of the original 948cc engine and replacing the 1275. I recently finished the process of installing a Datsun 5-Speed transmission. The car is now "Willie Nelson" all the way. Many cars, British, Japanese, German, and American, have graced our driveway over the last 30 or so years and the little Bugeye has patiently watched most of them come and go, knowing full well, even when I did not, that it would always be number one. This Bugeye is now undergoing a full rebuild. Click here to view the restoration pages.